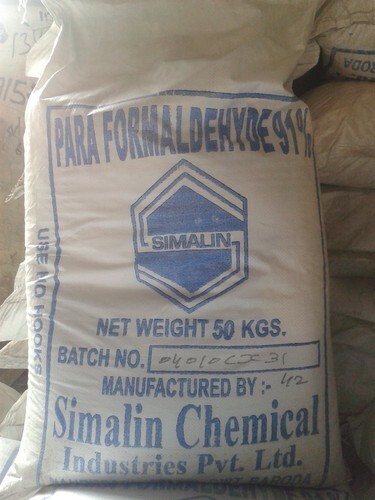 We are engaged in offering our clients a wide range of Paraformaldehyde. Replacement of Aqeous Formaldehyde in above resins. Its packing are done for 25 or 50 kg Polypropylene bags. Rajnish Inc was founded in 1998.Headquartered in New Delhi, India has endeavored to provide professional service in chemical industry. Due to its quick responsiveness, the quality of the products, efficiency to source hard to find chemicals and team of professionals, Rajnish Inc grows quickly and steadily and has become a one stop sourcing solution and service provider for many partners worldwide, Positioning quality and service as the key factor in each transaction, Rajnish Inc pays high attention to pre and post sales service. Our research institutions are able to carry out various analysis as per requirement. Our RCC brand is very famous in India because of its constant quality and competitive price. We are flexible enough to provide tailored individual service. Our business principles of trading on the basis of fairness, mutuality and quality guides us to achieve the mission of delivering service exceeding customer's expectation, by providing high quality products at competitive price, shipping them to anywhere in the world as required and integrating our expertise in our customer's value chain.